My first tv show was THE MERV GRIFFIN TALENT SCOUTS. I auditioned for the producer, Irving Mansfield and he (the show) introduced me to the viewing audience, where the other three acts were introduced by famous entertainers…this night it was Diane Carrol, Red Buttons and Jackie Leonard. I did a routine about stars making mistakes, like Elvis singing and at one point he slings his guitar behind his back causing the guitar strap to cross his neck and for a few lines, sounds like a duck. Anyway, the next day I returned to my job, a stationery store in my home town of Rockville Centre, New York. When I returned home that evening, I received a call inviting me to work at a club in Washington D.C , called The Shadows . I opened for twice a night for two weeks. 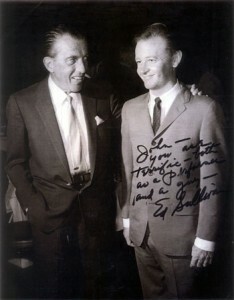 The Ed Sullivan Show came many months later. While working at Max Gordons “Vanguard” in Greenwich Village New York, I was invited to do my “Sullivan” routine at the shows dress rehearsal, by Ed’s talent co-ordinater…”And if the old man likes you, we’ll book you on sometime in the future.” He, Ed Sullivan, liked me so much,they shortened the acts of some of the other guests in order put me on that very night. I was invited back many times and loved every minute of it. It was THE show to do then but more important to me, the opportunity to mingle with a vast array of performers, actors, dancers, opera singers, rock stars, animal acts and on and on. Ed Sullivan was a master at knowing which act was to follow which act, in order to make the show flow nicely. Always a well rounded show and many times the viewing public were shown things they never would have believed they’d enjoy, until seeing it on that show. I think the tv remote control makes audiences flip channels before giving themselves a chance to see and hear something new. I liked Ed Sullivan and miss his style. The Garry Moore show was a kick, it was his return to a variety format after taking a few years hiatus following his long running hit show with Carol Burnett, Dirwood Kirby and others. This new one had as regulars, Jackie Vernon, Pete Barbuti, Lily Tomlin, me and oh yes, let’s not forget Dirwood Kirby.